There is a SHIFT happening IN ME. Not the shift thinking it was the 15th (a day early), waiting for my WordPress group to arrive. No. A different Shift into Transcendence, out of the past. Tuesday class at CSL Asheville with Reverend Dr.Barbara Waterhouse is called PRIMARY LESSONS IN CHRISTIAN LIVING AND HEALING – A Textbook of healing by the Power of Truth As Taught and Demonstrated by the Lord Jesus Christ, by Annie Rix Militz. The Copyright is 1904. She wrote it is 1900. [available for download as a PDF file on the CSL Asheville site/downloads/free books.] A little disclaimer here… Science of Mind, formerly called Religious Science, does not use the Bible as a text, despite the fact that Ernest Holmes, the founder of this philosophy, was once a Bible toting Christian. He sites scripture all throughout his text book Science of Mind, and gives it the metaphysical approach. This isn’t an ad for either the Center or the text, though both ARE superlative! With only two classes under my belt, each 2 hours long, it is the origins of basic metaphysics, not softened along decades or watered-down. It is raw, fanatical, vastly contrasted to what we are accustomed to thinking. Annie’s treatise exhorts us to be crazy, to think about what we are thinking about. That ‘be crazy with me‘ phrase really belongs to Barbara Waterhouse, as she responded to a question of mine during class. Remember… Militz wrote this over 100 years ago. ‘Thinking about what we are thinking about’ by itself is not foreign to me. I built my high school art education platform on that idea, with a view to introducing my students to their higher Self in a way they never knew existed prior to experiencing me and my room. However, monitoring my thinking 24/7? Oi! The contrast or relativity comes from not allowing my past to color what I think about now. That’s not as easy as it sounds. Doing this for six weeks, the length of the class,24/7, is the experiment: Seeing the results: Witness life altering events, notice what different things we attract by focusing only on the GOOD of GOD, deposing myths from religion and education, and popping bubbles of personal history that color our choices and decisions. It’s about 24/7 thought monitoring, denying the bad followed with prayer treatment for the good, and proclaiming the ABSOLUTE TRUTH, THE UNMUTABLE GOD LAW where relative truth (the personal opinionated kind, the ever changing) rears it’s ugly head with pain, suffering, prejudice and judgment. PHEW!!! ABSOLUTE, NEVER ENDING, NEVER CHANGING, NEVER ALTERING NO MATTER WHAT – T R U T H. Not Bible truth. Jeez, that has been rewritten over 400 times, with at least as many books to fit into the influences for all occasions, all political-religious doctrines. It IS METAPHYSICS: Beyond the Physical. 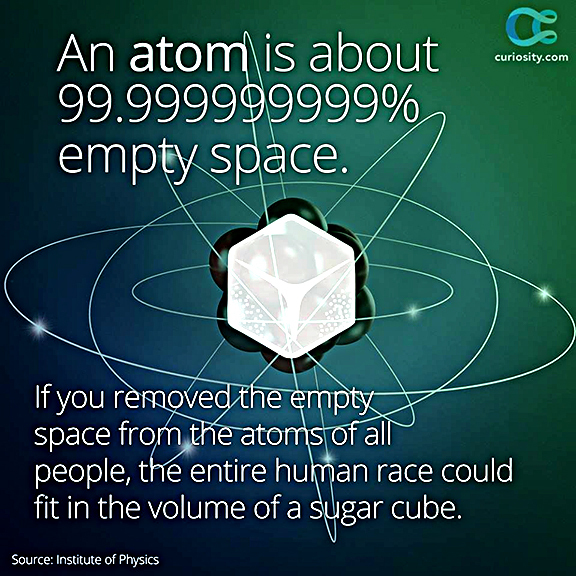 Quantum Science. Made manifest. A sugar cube. What could be easier to imagine? If the sugar cube quote doesn’t tell us that WE ARE ALL ONE, then what else can? To be more specific, ‘we are all one, each a unique expression of the divine’… Even the dark characters in history. All from the same Source of Creation… God Energy. We are the Thing Itself. Another idea is: If all that existed was Source Energy, by Itself, Alone in the cosmos, and IT decided to CREATE, all it had to create out of was Itself. Therefore, anything, anywhere, that is visible (1%) and invisible (99%), IS IT! There are all kinds of dastardly things happening on planet earth, third rock from the Sun, these days. Since we are all at choice [Free Will], some of us choose deeds that do not serve humanity at large but rather serve an elite segment of humanity, and its greedy intentions. The good news is that there are many more Good Guys, people who are in and of the Light, holding the veil back, opening up earth energies and ‘lay lines’ that have been closed to us, up until now, for fear of misuse of power. Now we are ready to SHIFT our focus to support the ONE of who we all are together. The Good that is happening that has thwarted other ‘Agendas’ that supposedly were slated for 2013. I, for ONE, am still here to talk about those efforts and perhaps WAKE UP others to join our Unity for Good, and TRANSCEND. Below are quotes from different blogs supporting the AWAKENING. Please keep the perspective that there are no ‘evil’ forces. We are all God creatures with free will choice. Some of us choose being the dark side and some of us choose the light. These quotes are for those of us that still have our feet planted in the 3D world around us, are still in duality, who are following global events daily. No. That’s not 100% ‘being crazy’. But it’s a step into Transcendence. “We are now seeing splits amongst them [the Cabal]. Each faction is trying to take control. For us, it is necessary to be of one mind, leaving our petty differences, like race and religion etc., aside. You are the human race and you are refusing to allow yourselves to be wiped out. When you seriously consider all the methods they are using to destroy you, you’ll see that everything they do is designed to destroy the quality of life, and to create illness and suffering for the masses. OK. ‘act as one’. Here. Now. My teacher has a one track mind and pays no heed to these dark events. Her primary purpose to to focus on the Divine energies inherent to us as a race and she keeps her eyes on the prize and BEING MORE. Instinctively Waterhouse planted her feet firmly in the notion of teaching this class on Healing, according to scripture, presenting New Thought in it’s infancy and purity… The One is in true alignment with unceasing other mind-sets globally. This is a video presenting how the dark side activities go against NATURAL LAW and is rated ‘G’ for all ages to WAKE UP. I am focusing on creating my ‘taste of freedom”: Turning OFF the chaos, focusing on a Universe operating in perfect harmony and balance, brings God consciousness reflecting in the minds of everyone, everywhere, STANDING TALL, demonstrating their Right to Be Free. FREEDOM RINGS Creating a world that works for everyone. The ‘US MOMENTUM’ Golden Age IS TRANSCENDENCE.